THE GROW ON WINDSOR CAMPAIGN IS NEARING THE END. Thank you to all who supported our Limited Edition Grow On Windsor products! Guys, you’ve made it this far growing out those beards – it’s almost time to shave it all off. 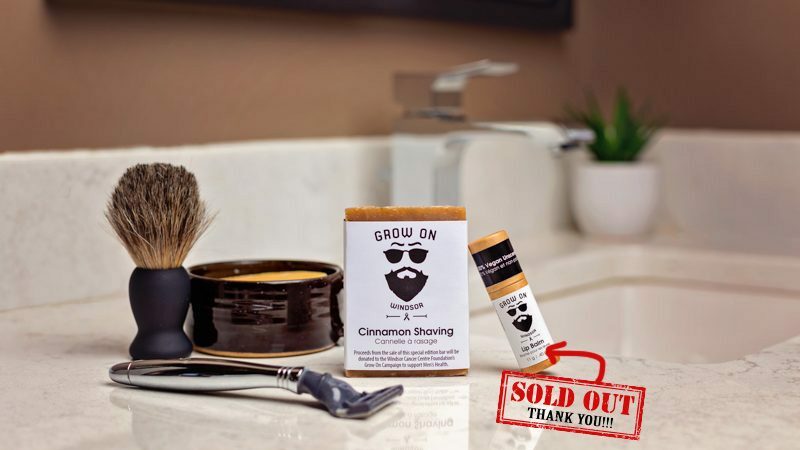 In celebration of Giving Tuesday, we are sending a reminder that we still have a small supply of our special version of Cinnamon Shaving Soap available. 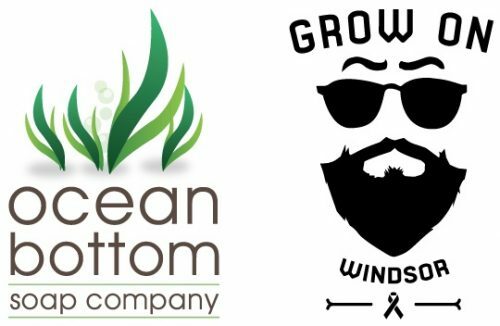 All proceeds support the Windsor Cancer Centre Foundation’s Grow On Campaign. Our Lip Balms have SOLD OUT! Get it before it’s gone and support a great fundraiser. Order online and pick up in-store at your convenience! Each November, a curious thing happens…. “…men disregard their standard shaving regimen, ignore heckles from their wives and friends and let their ‘staches and beards grow with wild abandon. Are they preparing for winter hibernation? Testing out a new form of food capture? Revolting against the razor industry? 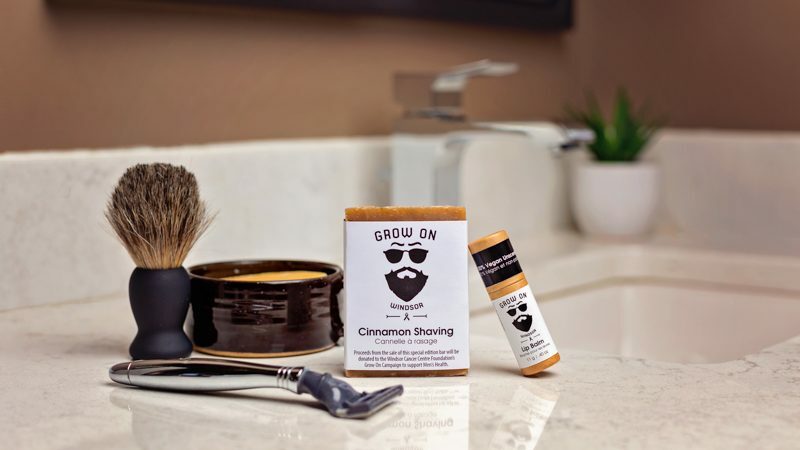 To support the Windsor Cancer Centre Foundation, we have created a limited edition Cinnamon Shaving Soap and Vegan Lip Balm with proceeds going to the Grow On Windsor campaign. Grow On supports awareness and treatment of men’s cancers with all funds raised staying in our community. So men, start growing those beards and come December 1, our special edition Cinnamon Shaving Soap will help you take it all off. And for the ladies, keep those lips soft, supple and ready to be kissed with the Grow On Lip Balm. Warm summer days spent playing in the sun soon give way to summer evenings spent around campfires, pool decks and outdoor parties. Outsmart the buggy party crashers next time you venture out after dark with our all natural insect repellent from our Don’t Bug Me Collection. This biodegradable spray is safe to use on your skin, shoes, camping equipment, patio furniture and more! The diverse oils combine to protect adults and children from flies, spiders and other pesky insects. If venturing deep in the woods is your thing, we have created The Hunter with additional ingredients to ward off ticks. If you have forgotten your bug spray and the pint-sized vampires do strike, our Bug Bite Rollerball delivers speedy relief of itching and redness. “I had forgotten to apply insect repellent and after an evening of playing out in the backyard, I noticed my 4 year old had quite a few little mosquito bites on her back and legs. They looked like typical mosquito bites and weren’t bothering her at the time, so I thought nothing of it. The next morning, I noticed her bites were much larger and she’s finding them itchy. I grabbed the Kids Afterbite I had on hand and applied it to all of her bites. My Mother was instructed to reapply around lunch time if the bites were still itchy. When she was picked up later that evening, the bites were much worse! It looked as though the Kids Afterbite had burned them. I asked my Mom what happened and if my daughter had been scratching at the bites. The Kids Afterbite had just been reapplied in the 2 hours previous. Whatever your outdoor activity, our Don’t Bug Me Collection has you covered. Bug Spray is available in 100ml spray bottles for Adults (age 10 and over), Children (age 6 months and over) and the extra potent Hunter version. Bug Bite Rollerballs are 10ml and available in both Adult and Children’s versions.